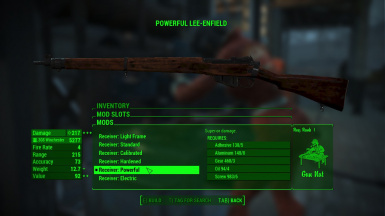 The vanilla mod merely has a tier-1 'More Damage' receiver named 'Receiver: Hardened', that leads to bad performance against tougher enemies when loaded with .308 cartridge. So I create a tier-2 attachment myself by FO4Edit. I take the recipe, perk requirement and buff of Hunting Rifle's Powerful Receiver as a reference for that of SMLE's counterpart.